THEM Anime Reviews 4.0 - You're Under Arrest: No Mercy! Notes: This is a spinoff from the second You're Under Arrest series. 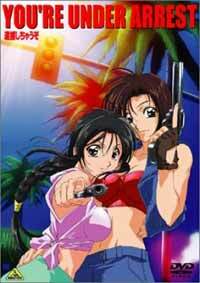 Miyuki and Natsumi have been transferred to the LAPD, and while working with the officers there, they are plunged headlong into a car theft investigation when Miyuki's car is stolen. Is there more to this theft ring than meets the eye? Will Miyuki and Natsumi be able to uphold the honor of the Bokutou Traffic Police? What crack were the scriptwriters on when they were writing this? With the visual imagery of Natsumi plowing down a Los Angeles street shouting, "Tomari nasai!!!" and pumping shotgun shells into a speeding Ferrari, we begin the review of the worst thing that could happen to the You're Under Arrest story : the No Mercy special. Ever since the day when the first Marlboro Man set foot in Japan, said "Howdy partner" and passed out ciggies to Japanese townsfolk, many Japanese have wanted to go to America. Unfortunately, not many people get to, so they send what they can : Hello Kitty, L'arc~en~ciel, Gackt, and now ... the girls of You're Under Arrest. Now just before you start writing that flaming e-mail about me messing up Japanese history (and there being no cigarette ads in Edo period Tokyo), read the rest of this review and then decide if you'd like to address the mail to those involved with the production of this show. You see, this isn't a sweet, heartwarming, and funny special about Miyuki and Natsumi having a great time working as police officers in Los Angeles; it's about some scriptwriters seriously mixing up American law enforcement with Judge Dredd and Terminator reruns. For no apparent reason, we find Miyuki and Natsumi working in the LAPD, with the whole cast of the Bokutou police station almost being there. To be precise, their characters are there, but they're the -American counterparts-. Nakajima Ken is now "Cain", who looks exactly the same save for the blond hair (and the obvious womanizing attitude), Yoriko is tanned and called "Rico", Saori is "Sally", and the list goes on. Even the Chief has become, well, the Chief, plus an insane desire to pull out his guns and blow the brains out of petty criminals. Don't raise your eyebrows yet. The premise of the plot was simple enough, but its execution spells death to all semblance of reality right from the opening scene. As mentioned earlier, the No Mercy special is one of the biggest collections of misperceptions of American law enforcement since, er, Police Academy. Miyuki and Natsumi get to open fire with shotguns and sniper rifles on speeding drivers without provocation, the Chief and Sally get to draw their weapons on arrested suspects and yell at them in the police station (you can begin to imagine the lawsuits already), and the cast get to bust the car theft ring while off-duty, in swimsuits, and brandishing heavy weaponry. And when I tell you that said "busting" involves blowing a hole in the side of a warehouse with a rocket launcher, and Yoriko ... I mean, Rico firing live rounds from an automatic rifle, you'll start to question whether the production staff were fresh off an A-Team rerun marathon session. For a special, even the animation is pathetic, and the soundtrack was reused from the second TV series. Sadly the OP and ED songs are also forgettable. They still kept all the usual seiyuu, though, but that wasn't enough to save this pile of crap from mediocrity. I don't live in America, and even *I* know that US law enforcement doesn't work that way. There are procedures to follow - you know, paperwork and "calling for backup" and so on. The No Mercy! name must have come from either the staff's desire to descrate the YUA storyline/continuity, or their (obviously wrong) visions of Yee-Haw American Police Officers firing 20mm chainguns from police trucks while in a mad frenzy. Either way, back away from the OAV slowly, and put your hands where I can see them! Now stay there, while I get my shotgun. Recommended Audience: There's more than the usual toned-down YUA violence. It's also a totally wrong portrayal of how police officers do their jobs (even the TV series never got this wrong), so you shouldn't show this to any kids unless you want them to grow up to be psycho police officers or Governors of California.